HAWT TALK WITH TOSAN: A crucifix was found in Mars? 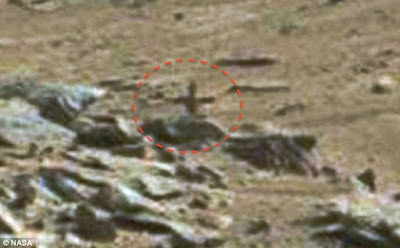 A crucifix was found in Mars? UFO hunters claim they spotted a cross and ruins of a carved roof on Mars. This was first claimed by a UFO hunter in France, who noticed the unusual shapes in a photo taken by Nasa’s Curiosity Mars rover. The alleged cross seems blocked by rocks but reportedly it is said to be much bigger. Geez the Devil is everhere still fooling people in other worlds.